We met with this client in Dublin and they had an old paver patio which they wanted to upgrade and expand with a new design that included a beautiful deck with a low maintenance hot tub and a paver patio with a fire pit that was also low maintenance. And they wanted some extra room to entertain their friends and family. We created a 3D design (shown to the right) which provided them with a visual representation of how it would look, and they were very satisfied with this. For a free design and quote for your Custom Upgrade. Creative Earthscapes designed a 400 sq. ft. Trex deck with 2 sets of stairs. One leading down to a 500 sq. ft. Unilock Beacon Hill paver patio complete with a fire pit, seating wall, and 2 pillars. The second set of stairs leads down to a walkway along the side of the property creating an elegant path to the driveway. We also worked in some LED lighting to complete this design. 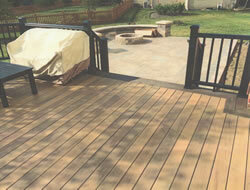 The deck has a Timbertech Legacy floor Tigerwood with a Mocha picture frame and a Mocha fascia. The floor is installed with a patented hidden fastener. 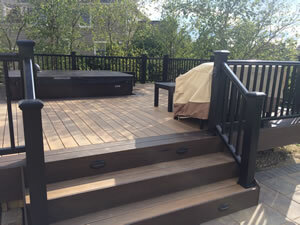 The deck is installed around a hot tub, which sets on a concrete pad, with a picture frame around the hot tub and an installed access panel. The patio has a Beacon Hill Flagstone Sierra floor with a charcoal board. It has 2 pillars and 18 feet of seating wall built out of Brussels dimensional stone with a charcoal accent row. The walls and pillars are capped with Unilock Ledgestone caps and capping. 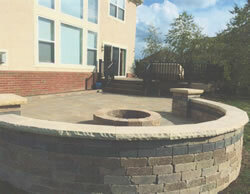 Creative Earthscapes installed a 12" tall fire pit for those spring and fall fires enjoying time with the family. The Beacon Hill Flagstone walkway is often a great way to fix a drainage issue. In this case, the client was getting a lot of sitting water in this often traveled area of their yard. We decided a walkway slightly raised would prevent the water from sitting and give the client a nice way to navigate their yard without muddy shoes. The walls and pillars are built out of Brussels Dimensional stone with a charcoal boarder and capped with Ledgestone, which defines the firepit space and creates a nice place to sit and enjoy a family fire. CALL 614-322-3333 Today, for a free design and quote for your Custom Upgrade.